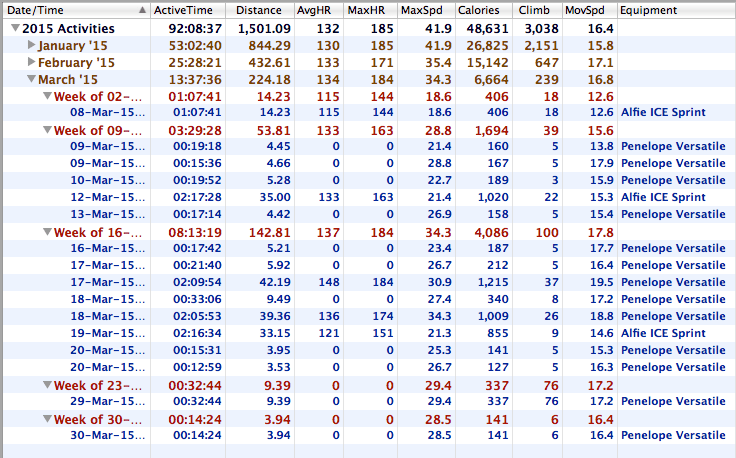 Here is the summary of rides I did this month – as you can see, not very many, only 224km! 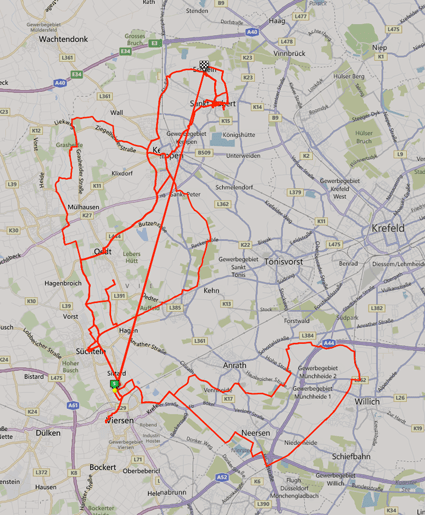 And this is where I rode – not very far afield at all! As mentioned in last month’s blog post I was hit rather badly with the flu in February/March which seriously curtailed my cycling and meant I dropped behind my year target (10,000km again), having been on track for January and the first half of February. But the summer is coming and that will make it much easier to crank out more miles! I started with a very gentle ride with Klaus, Claudia and Lara. Claudia seems to be enjoying using my old Trice Q. 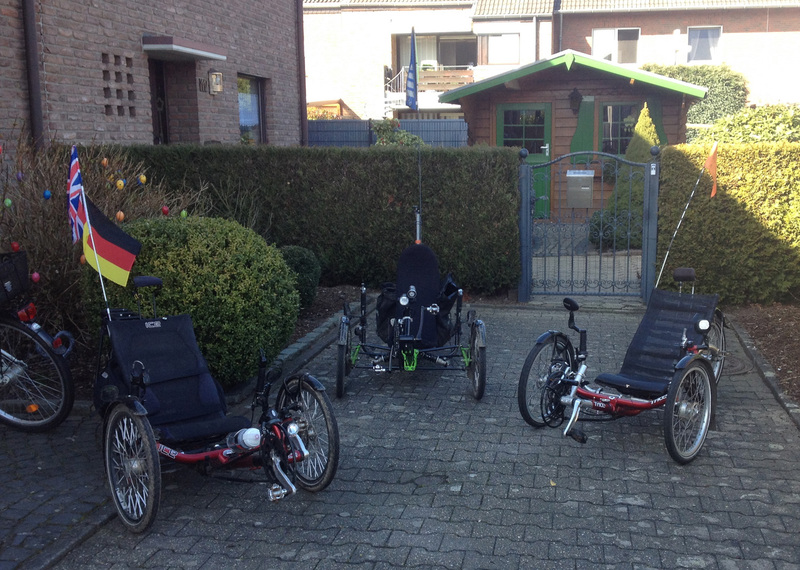 Here are all three recumbents ready for the off. I attended the monthly Fahrrad Stammtisch again (my first longer cycle ride since the flu, riding there with Klaus). There had been a bike exhibition in Essen recently and two people had visited the ADFC stand and found out about the Stammtisch so we had some more faces. 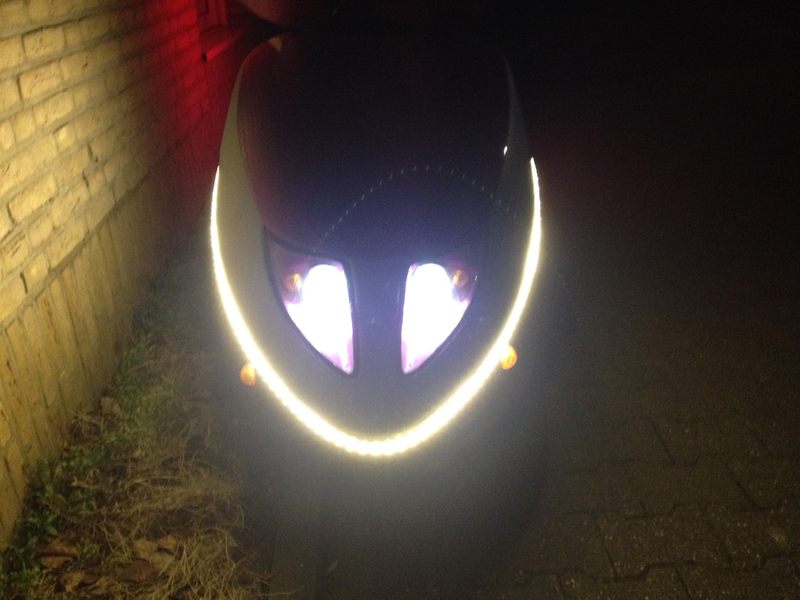 I have enjoyed riding Penelope with her cool new lighting – which gets an awful lot of attention. 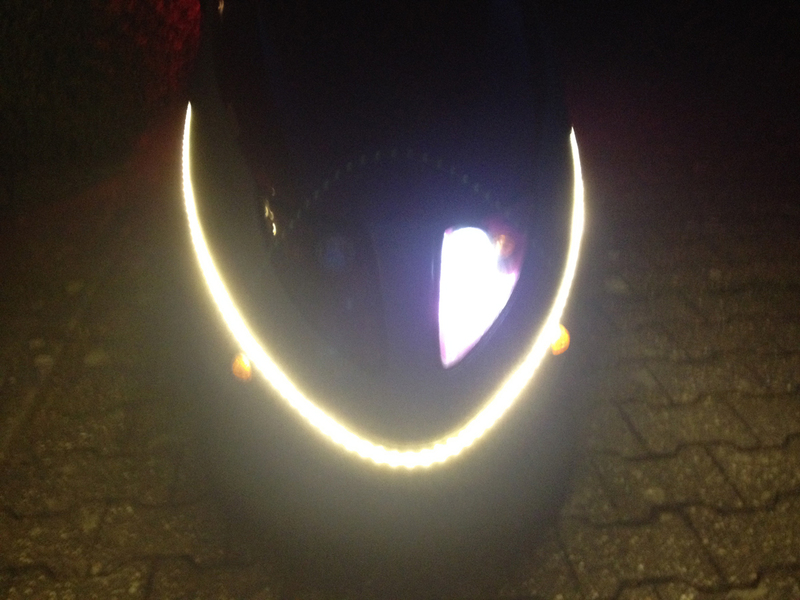 I also seem to ride faster with the LED striplights on! 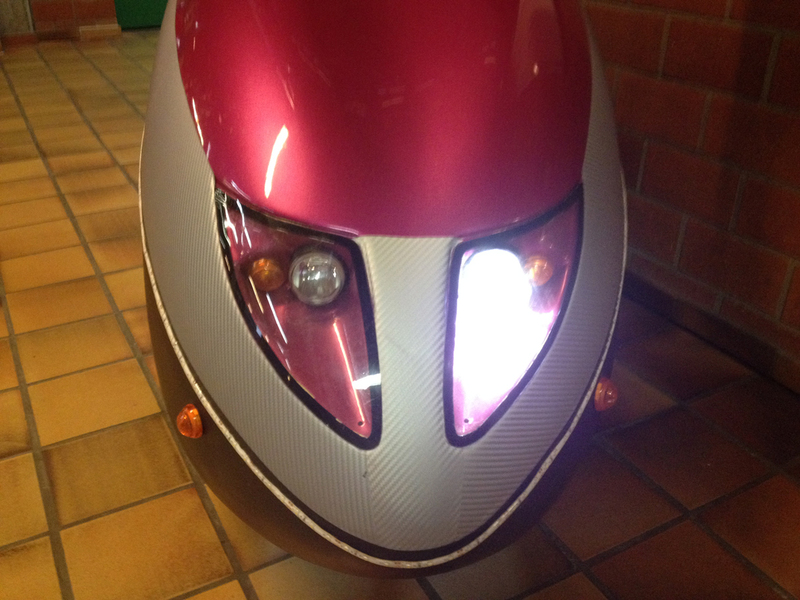 This means that Penelope was now technically legal in Germany (you’re only supposed to have one light) but clearly something was amiss. I sent the photo to Klaus and he suggested I pop round on the way back from the VHS and he’d have a look (he lives just 2km away on my route home). So I appeared at his door at nine at night and he quickly identified the problem – in the tangle of wiring beyond my feet a plug had come undone. He sorted it within a minute and commented “we’ll need to change this for a better connector”. I had had a bumpy ride to Viersen along a rutted cycle path so perhaps that’s why. But this time, as I knew what the problem was, I was able to fix it – although I wouldn’t have minded arms about a foot longer to assist with scrabbling around in Penelope’s nose. If you’ve been reading this blog from the beginning of the ‘Six Wheels In Germany’ time you may remember I set myself some goals for this year in Germany (which has now extended, of course). But did I achieve them? With regard to item 1, the VHS did offer for me to go up to the C1 course after my first semester of B2.2 but the course was on a Wednesday evening (when I have my Süchteln choir) so I decided to stay on in B2.2 as I am still learning plenty at that level. So I think (a) has been achieved. (b) Is still a work in progress but I have only about fifteen churches to go now. (c) I have joined two. (d) I joined the ADFC and ride with them, plus the Fahrrad Stammtisch and also lots of rides with Klaus. So I guess I have achieved that too. Hurrah! And after a year in Germany, what is my general impression about the Germans – are the stereotypes correct? Well, as you’d expect, the answer is ‘yes and no’. Some stereotypes are correct, such as the significant bureaucracy in Germany compared to the UK (you have to get your chimney swept every year, for example. This is recommended in the UK but not mandatory). I have also found that German people are generally punctual (which is good as I am too), and they eat a lot of pork and pork products. What has been quite different than I expected is the friendliness of Germans – even those I haven’t known long. The fact I speak some German clearly helps but I have been overwhelmed by how friendly and hospitable people have been. When ill with the flu I realised I had at least eight different people whom I could have phoned to asked to do things for me such as do some shopping, although this was not necessary as my landlady sorted me out, but it was very encouraging to know I had made such good friendships in a relatively short time. Having read a lot on Toytown (English-speaking expats forum) I had heard a lot about petty nitpicking from neighbours, strict adherence to pointless rules etc, but I have seen none of that here. Everyone seems laid back, helpful, understanding and not too fussed by the rules (such as not mowing lawns on a Sunday, etc, not that I have to do any lawn mowing). All in all this has been a fantastic experience of living in another country and culture, improving my skills in another language and getting to know a diverse group of people among whom I count some really close friends now. In fact, as I said to my mother the other day (and I had a bit of an epiphany moment whilst saying it), it’s probably been the best year of my life so far. I’m leading a cycle tour to SPEZI Radmesse over the last two weeks of April. It will be a group of five trikes (me, Klaus, Simon and Joyce from the UK and also Nigel, a very experienced long-distance triker). That will be four ICE Trikes and one Steintrikes. Anyway, Klaus doesn’t have any proper cycling waterproofs (being German he used to just leave his trike in the garage over winter; I have now trained him better) so he thought for a two week tour he really ought to get some. We live an hour from Rose Biketown, a huge German cycling shop with masses of stuff (although the clothing seems rather expensive). Anyway, Klaus decided he would go along and see what he could find and I asked to tag along. This was on one of the days when I was still recovering from the flu so I was rather weak but I managed to help Klaus choose a set of very smart waterproofs (jacket and trousers), some overshoes and some socks, with occasional sit-downs in the shoes department to recover. Me, I managed to buy some socks and a waterproof bag for my tools – 15€ spent by me, Klaus spent rather more! 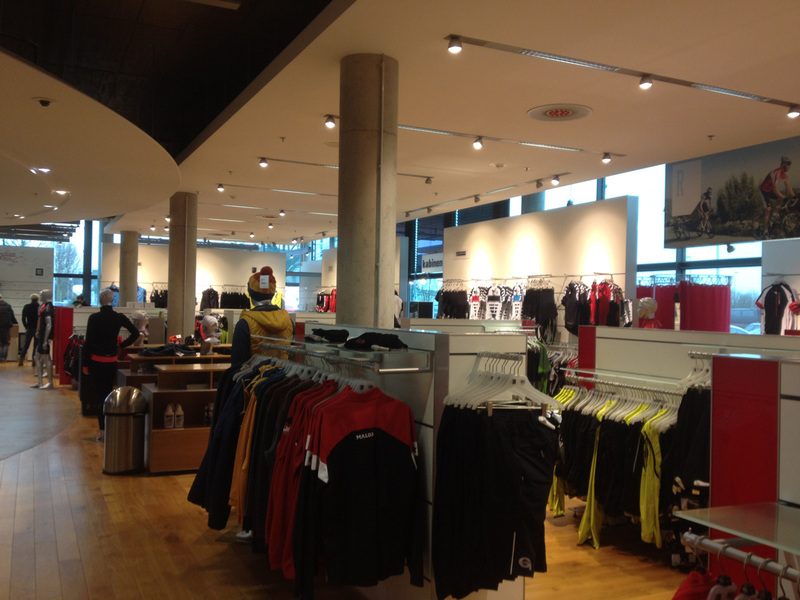 Here’s a view of Rose’s clothing section. Interestingly, if you want waterproof jackets your colour choice now seems to be black, red, green or high-vis. Klaus went for black as the jacket he liked the best only came in that colour. I’m a big fan of Andreas Scholl the German countertenor and have been for seven or eight years. Usually I go to four or five concerts per year, a couple in the UK and the rest in Germany (combining the concert with a short holiday). 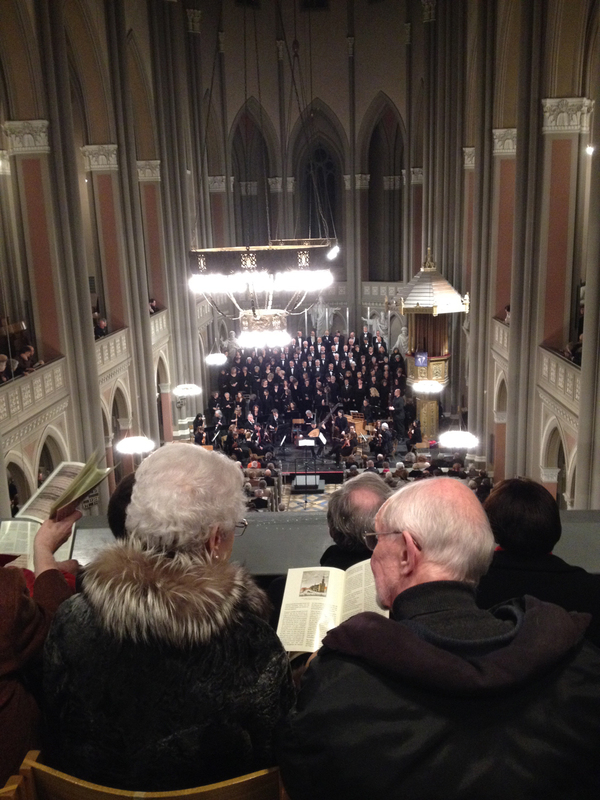 Anyway, having been in Germany for a year I hadn’t been to any concerts but discovered he was singing in the St John Passion by Bach in Wiesbaden this month. Wiesbaden is about two and a half hours’ drive away so I thought it worth the trip. I bought two tickets (I was sure I could find someone to go with me). The Alto voice only actually sings two Arias in the St John Passion, one of which I don’t really like, but I knew I enjoyed the whole Passion with the Chorales etc so it was worth the trip for me, even if there is only a very small contribution by Andreas Scholl. I was all set to drive there but a couple of weeks before, when Claudia found out I had a spare ticket, she suggested Klaus might like to come along (and drive me there). She would have really loved to come as well but was entertaining her brother as it was his birthday and they wanted some brother/sister time together. Klaus, being rather a third wheel, was offered as a taxi service, which I gladly took up (I am not very used to long distance driving now). 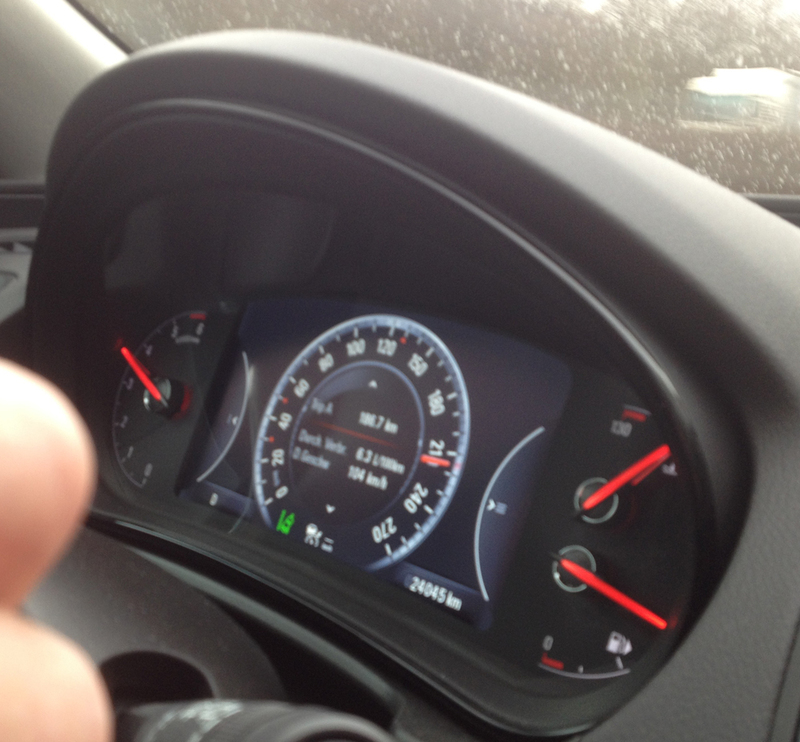 However the journey was a bit quicker than I was expecting as Klaus is not afraid to put the pedal to the metal. We arrived with plenty of time to have a cuppa (I eschewed the lovely-looking cheesecakes due to Lent) and a quick evening meal before going into the concert. Our tickets were in the ‘Orgelempore’ which turned out to be a balcony with an excellent view. The acoustics were not so great up here at times and the wooden seats a nightmare for the back and backside but the concert was absolutely wonderful. I have heard the Schiersteiner Kantorei before but this time they were even better. All the soloists sang well but I was particularly impressed by the Evangelist, Andreas Weller. All in all it was an excellent evening although with the uncomfy chairs I was looking forward to the interval… which didn’t come! They played the full two hours straight though. 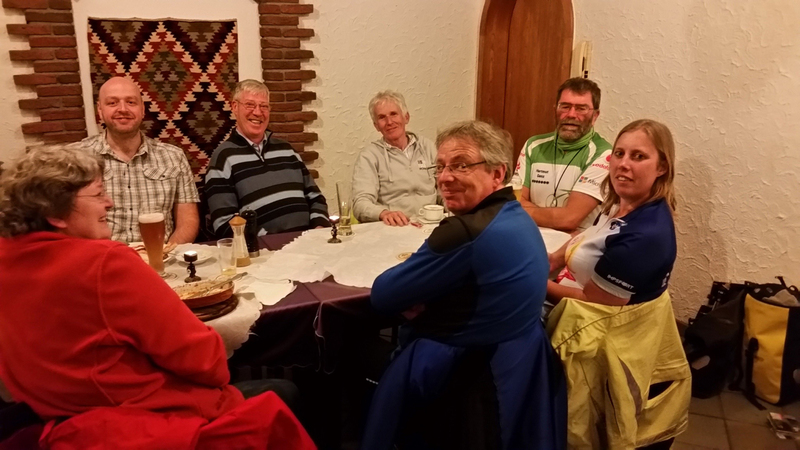 We had a quick cup of tea before returning back to Viersen – also a chance to use the loo in the café. (This photo is actually taken from the Schiersteiner Kantorei website but I’m not sure if it’s the same chap playing it). Every three months I visit England to see my husband, family, friends and to also have a day in the office in Eastbourne for our Sales Meeting. I have got into a routine for this now – I get a list of English things my German friends want (cider, various moisturisers, teabags, Horlicks Light, Kettle Chips etc) before I leave and when I am in Eastbourne for work I go to the Morrisons Supermarket next door to the office and get everything. 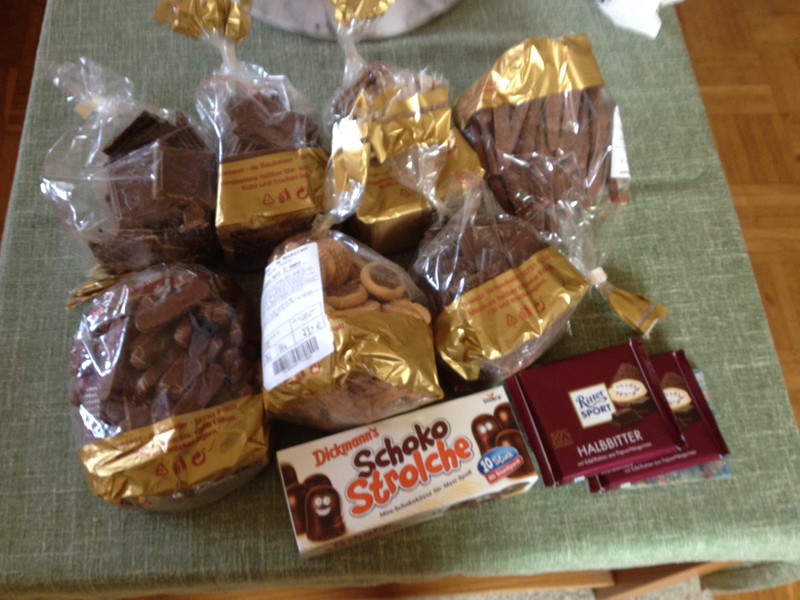 I also make my once-per-quarter visit to the Griesson de Beukelaer chocolate factory (any more frequent is dangerous for my waistline) and get supplies to share with friends at church, work and others. 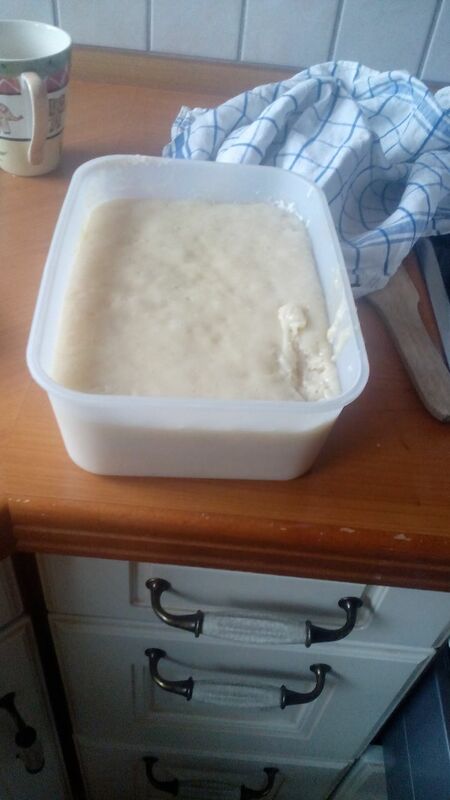 I did well this time! As usual I had booked the overnight ferry so spent the day with friends and headed off from the Niederrhein to Hoek van Holland at 17:30. My car decided to give me some disco party lights (low oil warning light, then low brake pad warning light) but I pressed on, wanting to get to the ferry. The Dutch are still redoing the roads around HvH so we had the diversion that takes the lorry route but I know where to go and it was fine. I arrived with an hour and a quarter before I planned to board the ferry (I like to leave it late so that Poppy has a chance for a final loo stop as late as possible) so I went to the Torpedoloos (Torpedo Lounge) again for a cuppa. And then decided on a waffle as I was a bit peckish! After a relaxing hour Poppy and I boarded. Here she is in the car boot. And here is my cabin – small but comfortable for the night’s crossing. I arrived back at my house in the UK at 7am. Poppy was delighted to see James of course. I had to go through all my post (three months’ worth) and this included my new YACF jersey that I bought second hand… which will undoubtedly be appearing in photos in this blog on the SPEZI tour which starts in 25 days. Just two hours after my return it was time to head off to church. We drove to Colchester and parked just down the road from the ruins of St Botolph’s Priory. We arrived very early as I needed to attend the choir practice. This is the interior of our church – it’s just 25 years old, built over some shops in Lion Walk Shopping Precinct. Although I am quite clearly in England in Colchester there are a few reminders of Germany – such as this Bockwurst stand in the precinct. 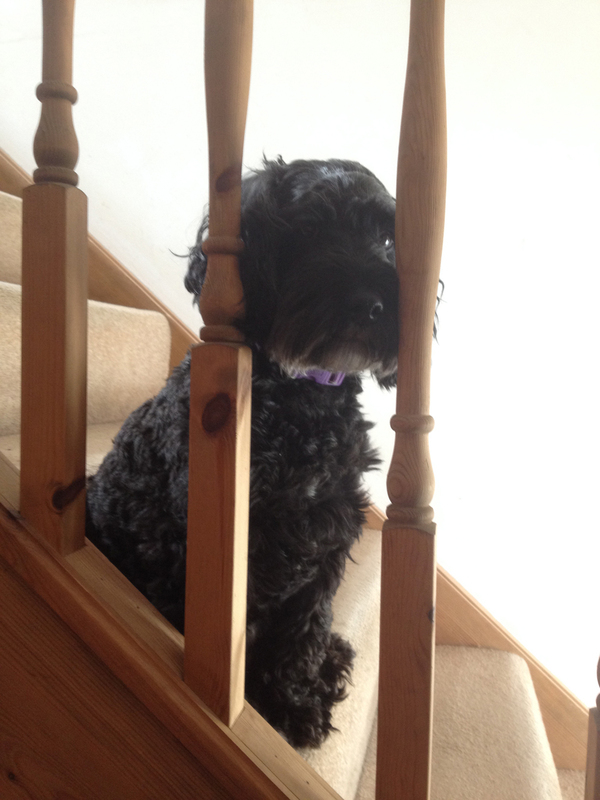 When we got back from church (where I had distributed lots of Griesson de Beukelaer chocolates) we discovered Poppy had found the sunniest spot in the house. I take lots of photos of the beautiful skies around Niederrhein each month but Great Bromley also has some impressive sunsets – I was treated to this one on my first day back. On Sunday evening we had some friends round for a Chinese take-away. I have not yet found a decent Chinese restaurant in Germany (and have really given up looking) so it was a definite must for this short visit back to England! And of course, to finish we also had a cuppa. And just to prove that I am a proper Brit at times, I made it in a teapot. It was good for Poppy to have a chance to revisit some of her favourite walks. 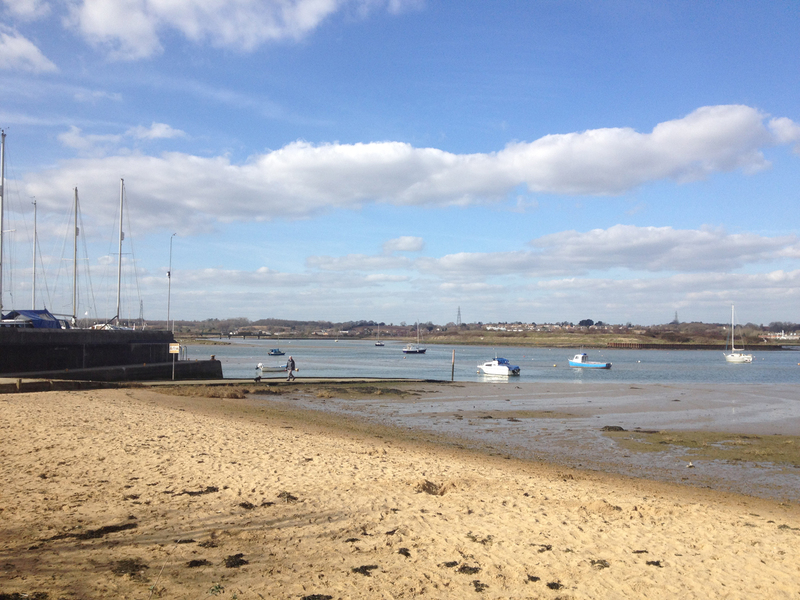 I took her for a walk along the Stour River in Manningtree on what turned out to be a rather nice morning. 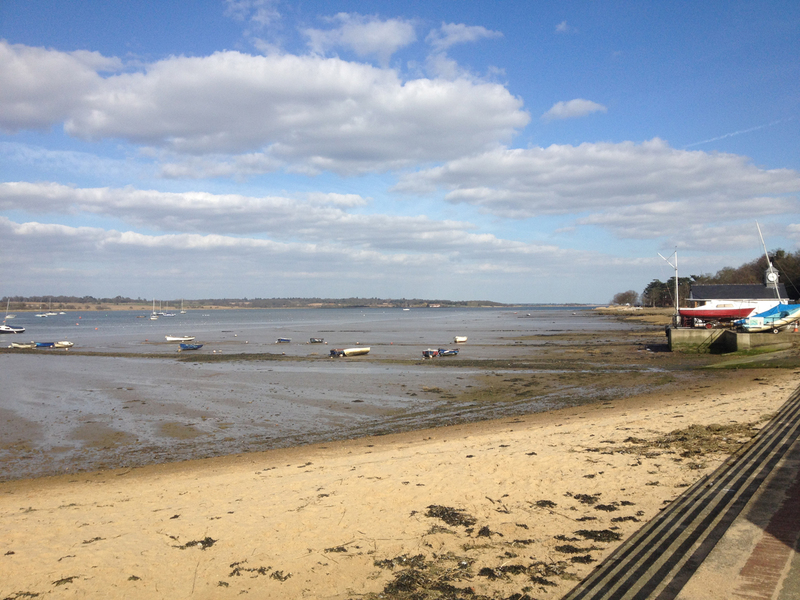 We then walked into Manningtree to visit the card shop for some birthday cards for friends. I’ve included this clock in this blog before – can you spot the mistake? I liked this advertising board outside a pub in Manningtree. As usual I had to visit Eastbourne for work as part of my UK trip so on Monday afternoon I headed off on the two and a half hour drive to the south coast and, with the reps and the boss and his wife, went out for another evening Curry at the Ganges Restaurant in Sovereign Harbour (where we used to keep our boats). And of course the following morning it was a Full English Breakfast at the Camelot Lodge Hotel again! The Sales Meeting at work went well and then it was time to head back to Colchester, stopping off in Tonbridge on the way back to see my in-laws and also my friend Charlotte whose birthday had been the day before. We went to Pizza Express which was nice but very pricey compared to German prices for Italian meals. It is interesting how quickly Poppy settles down when back in England and gets into her routines – here she is resting her weary head after a day of sleeping on the bed. I went for lunch with my parents, sister and niece at the Wheelhouse in Woolverstone Marina, Suffolk, overlooking the river Orwell. You can see the impressive Orwell Bridge in the background. It was great to see everyone and as a bonus my Mum and Dad have given me their old Dyson hoover (which they no longer use) as I can’t get on with the vacuum I have in my Wohnung. 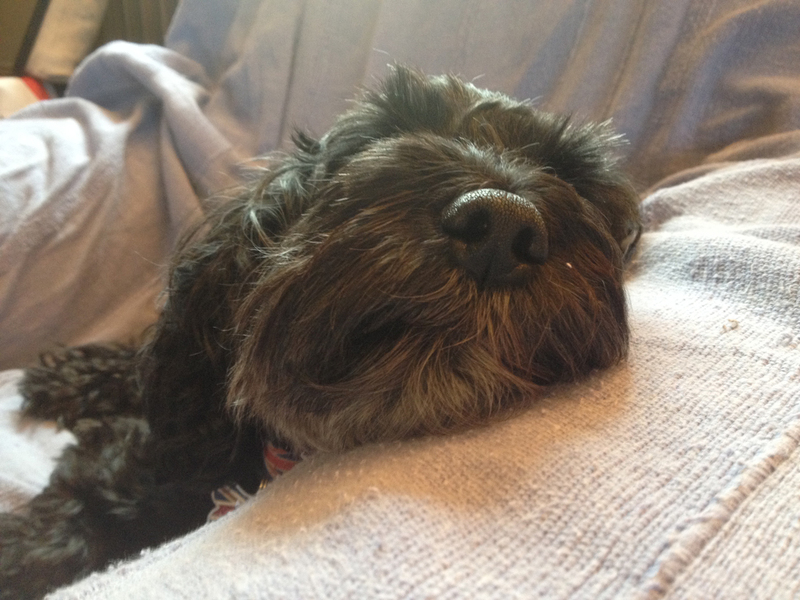 My last day in England was a day for routine appointments – yes, I had the excitement (and expense) of a trip to the dentist, the optician and the vets (for Poppy’s rabies booster). Which involved visits to Brightlingsea, Manningtree and Colchester too! Poppy of course realised that I was packing that morning when I put a few things in my bag and started to get a bit perturbed. I went off to the dentist in the morning and parted with £75 for the pleasure. In the afternoon James came along to walk Poppy at Manningtree whilst I had my short (and only £26) visit to the optician. When I got back from Manningtree I had an hour for a cuppa before it was time to go to my third appointment of the day – this time to the vet. Whereas for the worming treatment it just says ‘Veterinarian’. 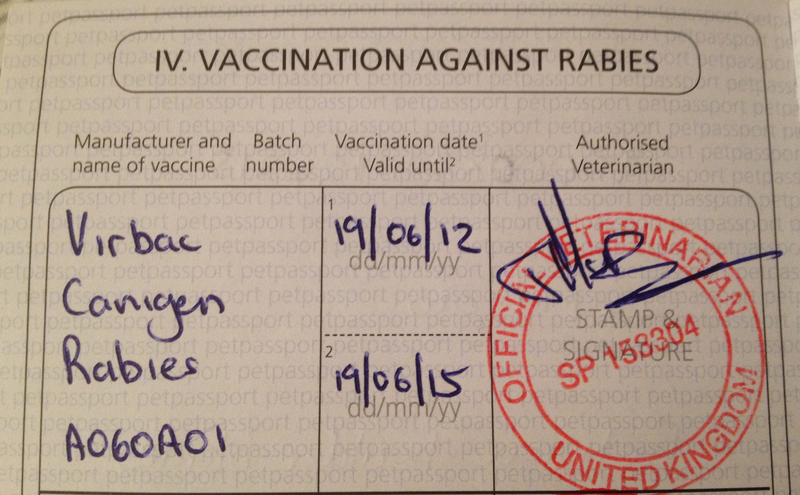 Yes a vet in Germany can administer the rabies booster provided that they are approved by the authorities in Germany. In GB we class them as Official vets in other EU countries they are referred to Authorised vets. You do not have to return to GB to have this booster. Any vet who is licensed in the country of treatment can administer and record the tapeworm treatment in the pet passport. A bit of googling showed this did not help much as I didn’t know what an ‘Authorised Vet’ would be in German and I couldn’t get anywhere with searching. So I quickly rang up my UK vet and fortunately they were able to book Poppy in for her booster, so she had it three months early but at least it was done by an ‘Authorised Veterinarian’. 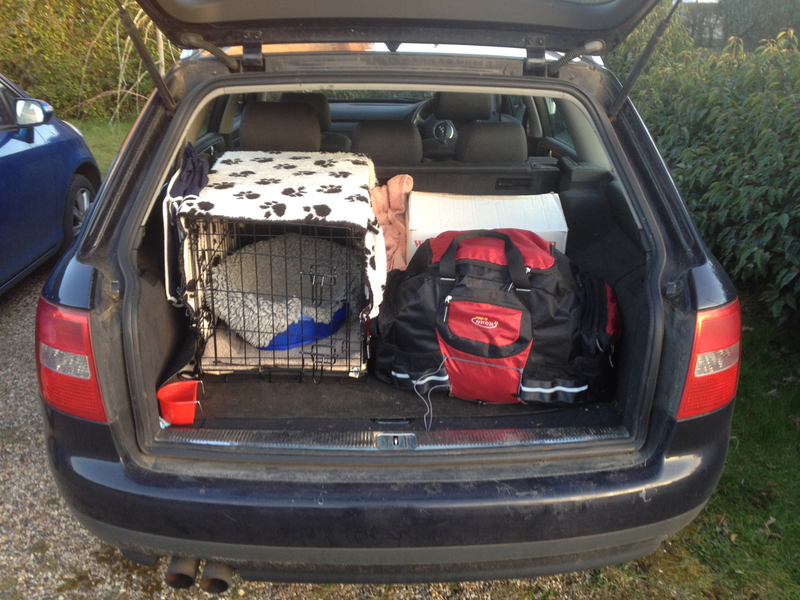 After that it was time to cook dinner for my husband (toad in the hole, as we were in England) and then I packed up the car ready to head off for the ferry at 9pm. 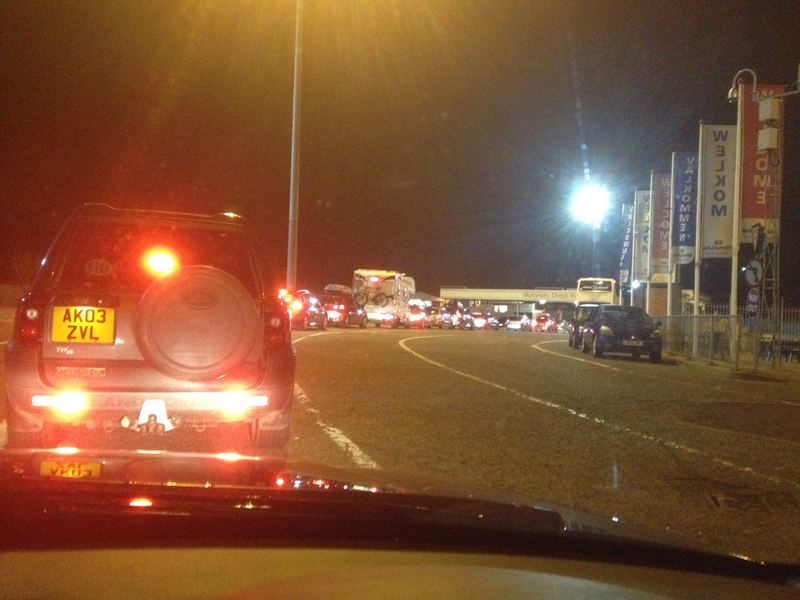 And the ferry itself was full. I just went to bed as usual. 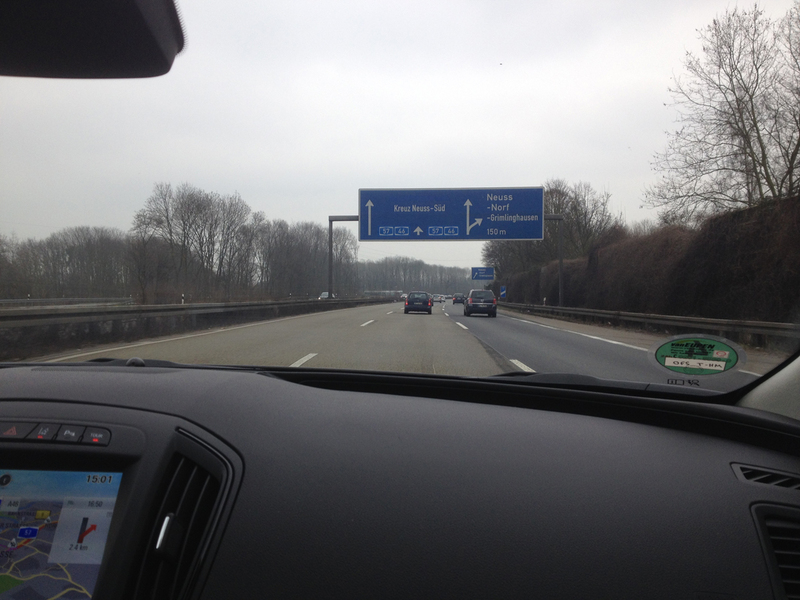 Then it was the two-and-a-quarter hour drive home and I arrived back in Kempen at 11am. Poppy gave everyone in my house a rapturous welcome and I was delighted to confirm that indeed the central heating and hot water were now working, hurrah! 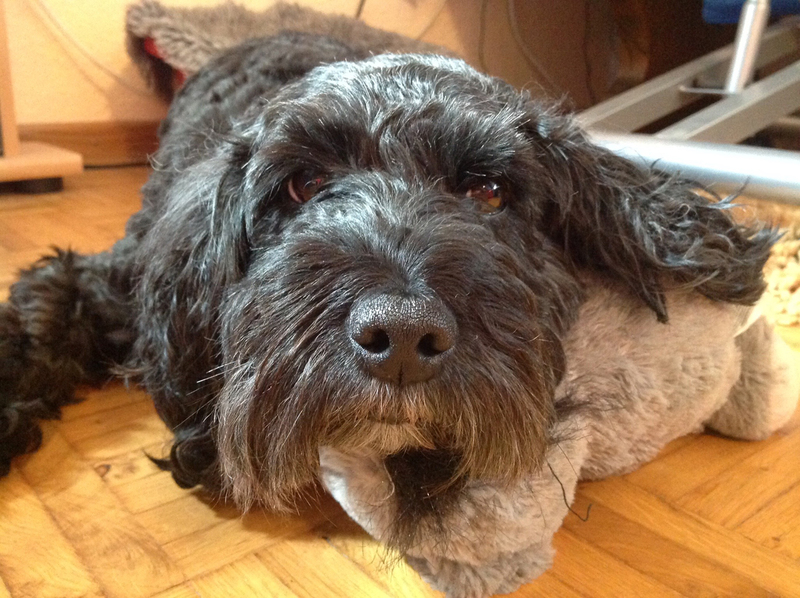 If a pillow is unavailable use a toy donkey. As mentioned, I’ve had the flu. Normally I wouldn’t go to the doctor’s for flu but interestingly the German websites about flu all said “go to your doctor as soon as possible” (whereas the NHS sites say “stay at home”). So I did the NHS option but after two weeks when I was still very weak several (German) friends recommended I visited the doctor. So in the end I caved in. Thus I was introduced to the German healthcare system. As a Brit I am used to the NHS “free at the point of need”. What this means (for those not familiar with it) is that you don’t pay any money to see the doctor, have no insurance or anything. You just register with a GP (Hausarzt) and go and see them if you have a problem. They may refer you on to a hospital if you have something more serious but your first contact is always with the GP (unless it’s an emergency and you go straight to the local hospital Accident & Emergency department). You don’t pay any money for ambulances, hospital treatment, doctor’s visits. You may pay a charge for a prescription (medicine) but this is capped at £9 per item and most people don’t have to pay (if you have particular long-term health conditions you don’t pay, if you’re over a certain age or out of work, etc etc). This is a fantastic safety net as you just don’t have to worry about healthcare costs. The money for the NHS comes from general taxation. There have been lots of media stories about long waiting lists and things like that, which can be true in some cases (if you have a non-urgent situation such as a need for a knee replacement, for example) but my experiences of the NHS have been almost universally positive, as have those of my husband and parents. We love the NHS. It is possible in the UK to have private health insurance as well but this is not something that most people seem to go for. Anyway, the German system is somewhat different. By law you MUST have health insurance, either private or public. I would have qualified for the public insurance (as I have come from the EU and have ‘paid in’ to the NHS for years) but unfortunately the way they work out my contribution, as a freelancer, made it rather pricey – 350€ per month. That’s a lot. However it is also possible to get an Expat International Travel Insurance policy which fulfils the German insurance rules requirements, and this is what I did (at £111 per month). It’s an AXA-PPP policy and is based in Tunbridge Wells in the UK (near where I used to live, in fact). I had been paying my £111 per month since I arrived in Germany. So now it was time to see if this policy would work – although I have a £300 excess per year so it seemed unlikely that I would actually end up claiming. So anyway I was ill. St Hubert has three doctors, which should I visit? I asked the Roddays and my friend Anja and had mixed advice. Lara said not to go to the lady doctor as she always gives out the same tablets that don’t work; Anja thought she would suit me well. I looked at her website and she was clearly into homeopathy (the pointless pills) so I discounted her immediately. The next two options, two male GPs, were in the same road so I decided to go to whichever one of those I could find. Lara came with me the first time to help out with translations if necessary. I arrived first at Bernhard Heithoff’s practice which looked new and clean. I went in and handed over my insurance card and they had a look at it and told me to go and sit in the waiting room. There were another nine people already there – in Germany you don’t have appointments, it’s just turn up and pot luck when you get seen (although you are seen in order). As there was a huge flu plague sweeping Germany I wasn’t surprised the waiting room was full of people. And, typical for Germany, everyone says “Guten Morgen” and then when you leave they say “Auf Wiedersehen” or “Tschüß”, none of this unfriendly ignoring British behaviour. After an hour and a half I was seen. The doctor was very nice and spoke absolutely brilliant English, which was great. I explained about having the flu and said that I felt my heart rate was rather high. He tested my blood pressure (very low – not a surprise as I had fainted in the shower a few days before and woken up lying on the floor very inelegantly) and my pulse rate was 150 which was very high as I was sitting down. So he said they would do an ECG (EKG) on me straight away – and lo and behold I was taken into the next room and the lady I thought was a receptionist (although she turned out to actually be a nurse, but in normal clothes) did the ECG. She took my blood pressure and said it was high but the ECG was borderline a bit high at 130, so better than five minutes before. I saw the doctor again and he suggested I came back the next day for blood tests and for another ECG. So the next day I went back (on my own) and had blood drawn. I declined the ECG as I’d been wearing my cycling heart rate monitor the previous afternoon and my readings were generally OK. I suffer from White Coat Syndrome (getting very nervous at the doctors) so readings taken there aren’t really very accurate. 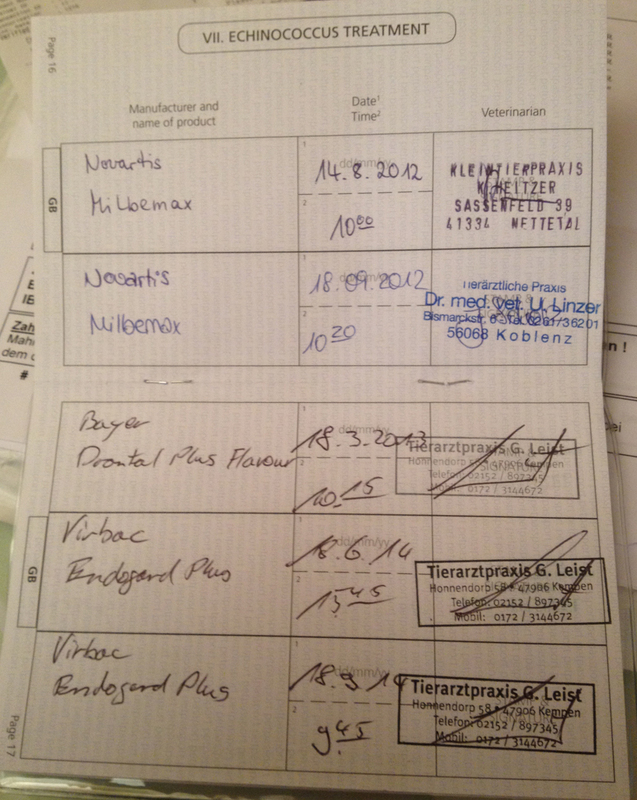 Also I had been informed by a German friend that EKGs cost about 80 Euros a pop – and I would be paying for this!! They took the blood, did not seem to mind about the ECG and told me to come back the next day. So the next day I arrived again, this time at 11am (when they said the results would be back) and saw the doctor after a wait of just half an hour. He looked a bit serious as he said a couple of values in my blood test, relating to liver function, were clearly very off. One reading (I didn’t get what it was) should be a maximum of 47 and mine was 1,620. He said he would do an ultrasound of my liver and lo and behold had a little room with an ultrasound machine and did it instantly. This was very reassuring as he said there was nothing obviously wrong with my liver, no gall stones or anything or liver tumour, but my spleen was a bit enlarged (not too surprising). He suggested doing some more involved blood tests the following week to find out if I had some kind of hepatitis, and not to drink alcohol in the meantime (I am a lifelong teetotaller so that was not a hardship). This was a Wednesday and the following Monday I went in to have the extra blood tests. In the meantime some of my symptoms for liver problems (related to what you might see in the toilet bowl!) had clearly improved a great deal and it looked like my liver was working pretty well again, plus I now felt much, much better. But the blood was taken and I then had the frustration of waiting for the results which took way, way longer than I expected (nearly two weeks – I thought they would be there the next day). In the end the receptionist rang up the laboratory and asked for them to send whatever results they had as I was going on holiday so they faxed through most of the results (which were all OK, according to the doctor). In the meantime I had no idea how much this was all costing but had contacted my insurance company who sent me a form for the doctor to fill in and also gave me a ‘claim number’ so this illness was officially registered on their system. So far so good. Because I have only had the policy 11 months they had to ensure this was not a pre-existing condition (pre-existing conditions aren’t covered until you’ve had the policy for two years) but it isn’t so that was OK. 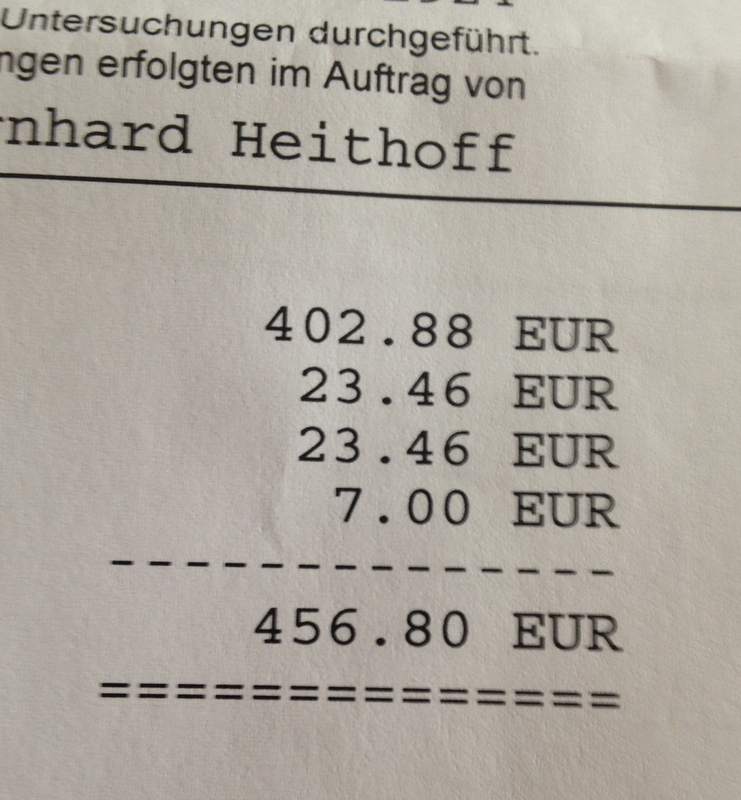 The bill for the first (simple) blood test came and it was 55€ so I paid that before my trip to England. On my return from England I had the bill for the Hepatitis blood tests – get a load of this!! I’ll have two more at 55€ to come, as well as the bill from the doctor, so the total is looking around 800€. It’s interesting to see how much healthcare costs – God Bless the NHS! Somewhat bizarrely, the flu made me go off cakes. 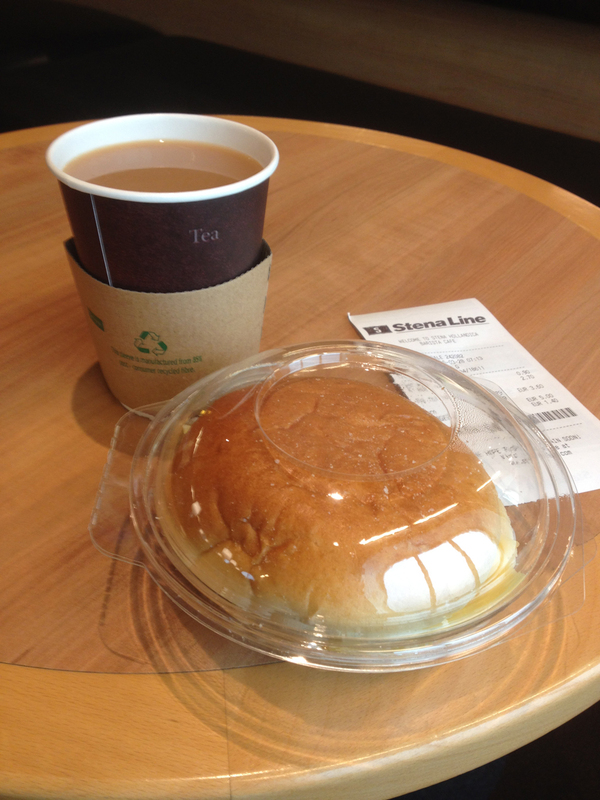 And once I was better I realised I’d had three weeks of the six week period of lent (Fastzeit) without cake so perhaps I could try to go for the full Lenten experience. Well, technically I did have cakes (two of ’em at the Tortenschlemmen) on Ash Wednesday but I decided to let that one slide. So anyway, March was a cake-free month for me. Wow. 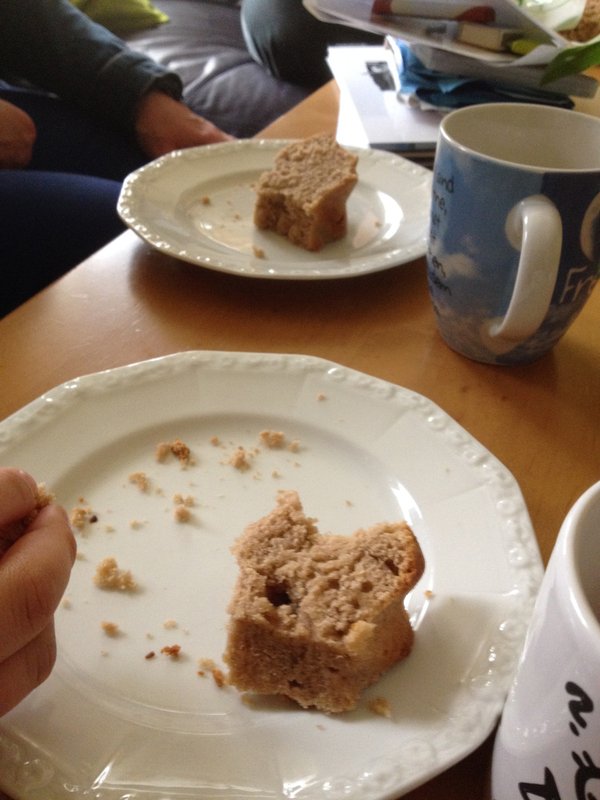 Anyway, this was the resulting cake that Claudia made – I didn’t try it (Lent) but it looked rather dry to me! At work in England we had lunch all together and a colleague had made a chocolate fudge cake but, due to Lent, I didn’t have a piece. A miracle!! As Sunday is Easter Day and normal cake-eating service will be resumed you can expect to see some more photos of the great German cakes in my next ‘Six Wheels In Germany’ post, but I’ll be writing daily blog posts during my SPEZI tour (from 20 April till 1 May) so there should be more to read in my blog before then. I’m writing this at ten in the evening on the 31st March – exactly a year ago I was boarding the ferry heading off for the start of this adventure. Long may it continue! Now, that IS bonkersly fast!